In this new daring adventure of the domestic imagination, redoubtable Traction Man returns with his faithful companion, scrubbing brush, to mount an expedition in the garden and scale the heights of the compost heap. Unfortunately, the climb proves fateful. Infected by muck, scrubbing brush is consigned to permanent quarantine in the bin by germ obsessed, pinny sporting Dad and replaced, in the dead of night, by Turbo Dog. Turbo Dog, battery driven and primed to flash his eyes and bark ‘I will be your pet!’, proves a liability on a hush-hush mission in the airing cupboard and grinds to a halt in the deserts of the sandpit. 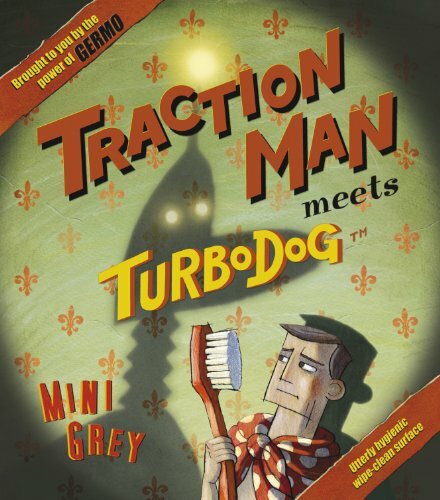 Meanwhile Traction Man explores far and wide – in the toy cupboard, under the bed, down the sofa and in the tool shed – in search of his lost sidekick. Finally, intrepid and properly kitted out as ever, this time in an airtight Astro-Suit and armed with his bleach gun, he braves the ‘Dark and Terrible Underworld of the Bin!’ Scrubbing brush, once rescued, needs a bath, but is it entirely wise for Turbo Dog to be floating so precariously on that sponge at the same time? Well, no, as it turns out. Another brilliant picture book from Mini Grey, whose sense of humour and adventure, love of the language of the toy box and understanding of childhood fantasy is matched by her pictorial invention and a skill at characterisation that can make even a scrubbing brush appealing (and ruthless in revenge, where Turbo Dog is concerned). Dare I say it, this is even better than Traction Man is Here. Will also appeal to older readers.